When I woke up from the C-section an hour later, there were still no answers. Nobody knew why Lydia’s heart rate was in the 50s when it should have been 140-160 bpm. Lydia was struggling to breathe even on the ventilator. She was alive, but nobody promised us anything. Over the next few days, a multitude of heart tests determined that our baby girl had complete congenital atrioventricular block (heart block), a dilated ascending aorta, an enlarged left ventricle, and an open PDA and PFO. She was also struggling with many preemie issues, including scarring of her lungs, difficulty breathing, regulating body temperature, and simply growing. Her body was using too much energy to live outside the womb while also having a heart rate a third of what it should have been. But there were not many answers. How are we going to fix her heart rate? Can she live like this? What will happen? On Lydia’s third day of life, the answers started to come. A blood draw showed that she tested positive for the SSA/SSB antibodies, which in rare cases can cause congenital third-degree heart block. It also meant she had received those antibodies from me through the placenta and thatI had Lupus. In one day, we both received life-changing diagnoses. Even after the definitive diagnosis, things were still uncertain for a long period of time. Congenital complete AV block is one of the rarest heart defects. In mothers with known lupus, it occurs in only 2% of pregnancies. It is so rare that there are no statistics on mothers like me without known lupus. It is estimated that in the United States only 100 children are born with complete AV block per year, and even though physicians know the cause and treatment, a long-term prognosis can be difficult. At 3 lbs, 4 oz at birth, Lydia was not a candidate for a pacemaker. She was too small, too weak, too fragile. Therefore, our job became to keep her alive, to help her lungs heal, to encourage her to eat, and to help her grow–all made more difficult by a heart rate so low it was difficult for her to do anything. On day 7, we were able to hold her for the first time. She was so fragile that we were allowed to hold her for only 4 hours per day. My husband and I would alternate days, sitting undisturbed for 4 hours breathing in every ounce of her life and spirit. Every day we poured our love into her, hoping and praying that she would make it. By day 58, we convinced the doctors to let us take her home. She hadn’t been growing or developing as they had hoped, but my husband was deploying overseas in two days and we didn’t want our only memories as a family to be in the hospital. So after some convincing, a long good-bye, and a quick welcome home, I sat at home holding Lydia, knowing that my sole job for the next 3 months was to keep her alive. Life had never been so important. For the next 3 months, I held her. I held her while she slept (which she only did for 20-minute increments until her heart rate got too low and she woke up again, an amazing survival technique). I held her while I walked laps around the house. I held her while I showered. I held her and willed her to grow so she could get her pacemaker and have a chance at living. We left the house only for doctors’ appointments, which were typically3 times a week. Generous friends brought us food and shoveled snow off our driveway. And we all prayed that my husband would return from his deployment as a pilot for the United States Air Force, with a daughter to hold. The days and months were long, but on April 26, 2012, a barely 8-pound, 6-month-old Lydia received her epicardial pacemaker and a new lease on life. For the first time in her life, she slept. She breathed when she ate. She became calm, like she had been waiting for this peace and comfort her whole life. Instead of struggling to live on an insufficient heart rate, like she was out of breath 24/7, she opened her eyes to the world. All was not smooth sailing though, and recovery included two additional surgeries to fix hernias due to her body being too small for the massive pacemaker in her abdomen, but we were beyond grateful. For the first time we had real hope for her future. Lydia is now a joyful 5 year old who is generous, kind, independent, thoughtful, and incredibly brave. She has had other issues including sleep apnea, lung scarring and difficulty growing, but they are minor compared to the gift we have been given. She will be dependent on a pacemaker for every beat of her heart for the rest of her life. She will continue to have ECHOs, EKG’s, pacemaker checks, holters, x-rays, and surgeries consistently for the rest of her life. There is no cure or treatment for damaged electrical cells. Pacemakers can never mimic an intact heart and therefore at times her heart rate does not match her emotions and activity or regulate her body temperature like it should, but we take the challenges as they come. For now, we are letting her live and enjoy life as much as possible. 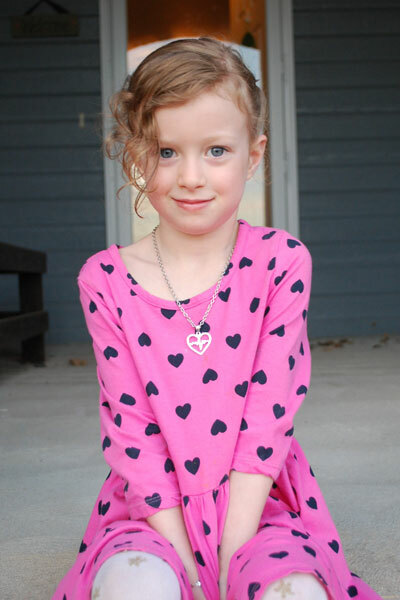 She loves to do gymnastics, dance, and ice skate and is an incredible sister to her 3- year-old brother, Lincoln. She is an avid swimmer, snorkeler, and biker. She has completed two, one-mile running races and two 5Ks with a PR of 33:57. We want her to know that anything in life is possible. Over the past 5 years our faith has been tested beyond measure, but it has allowed our family to grow immensely. We have created a tight-knit family across the world of heart-block families from whom we gain support and strength. Lydia has learned to use her pacemaker and her differences as sources of strength, and she lights up a room like no one else I know. Her heart, her bravery, her compassion, shine like a beam to all of those around her. Our hearts are full of gratitude every day for the life we get to share with her.